New York: Cambridge University Press, 2013. 244 pp. $26.99. The 16th c. C.E. 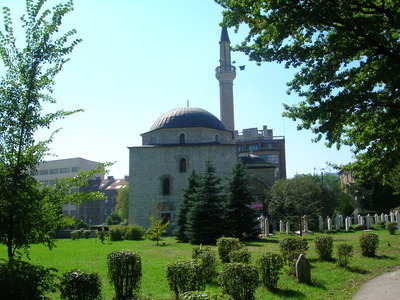 Alipaša mosque, Sarajevo -- Photograph Via Wikimedia Commons. The most beautiful and moving site in the city. Fatiha for the heroes interred there. Katz, associate professor of Middle Eastern and Islamic Studies at New York University, has written a thoughtful and at times eye-opening examination of the role of prayer in Islamic societies, part of a series produced by the Institute for Advanced Study at Princeton titled "Themes in Islamic History." Katz's goal here is to restore "ritual to its proper place in the study of the sharia, and legal analysis in its proper place in the understanding of ritual." Thus, she surveys the classical schools of Islamic law, explaining their differences on the details of prayer. But while these distinctions are typically minor (dealing mainly with such matters as the position of the hands or the correct number of prostrations), some have wider implications that resonate today. The author notes, for example, that Abu Hanifa, the eighth-century founder of what became the numerically dominant Sunni legal school, argued that prayer—as well as translation and recitation of the Qur'an—in languages other than Arabic, while undesirable, was permissible for a Muslim from a non-Arabic-speaking culture. This position, not shared by other schools, provides greater accessibility to engagement with the faith on the part of Muslim converts. Katz adds that while "almost all Muslims have historically prayed in Arabic," the debate over language "addresses the significant investment in learning required for proficient prayer." With this, she provides a historically-based challenge to the widely accepted fundamentalist argument that Arabic must be the exclusive language of prayer and study. Katz's book contains many surprises. She notes that requirements for the frequency of prayer have varied significantly in different Muslim communities, even among the "non-urban populations within the Islamic heartland," such as the Bedouins. Through the centuries, prayer was often neglected by Muslims who were prevented from engaging in it by work requirements or other limitations on personal time. The most hardline Sunni legal school, the Hanbalis, did not prohibit women from leading mixed-gender congregations in special Ramadan prayers. A leading figure in the fourteenth-century Zahiri school of literalist legal interpretation also argued the legitimacy of women leading mixed-gender prayer. The lines defining what is permitted in Islamic prayer have hardened over the centuries. Katz's indispensable study shows that the basis for triumphalist attitudes is on shaky ground and that the issues raised are by no means fully settled.